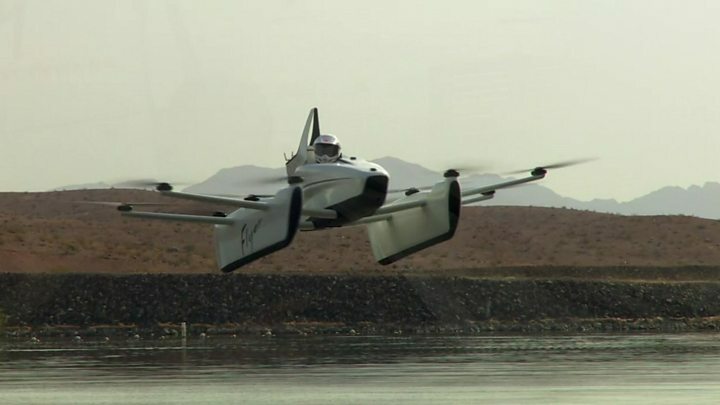 It seems just about everyone has been launching a flying car lately, but the Kitty Hawk Flyer stands out for one big reason: it’s here today. Specifically, it’s in Las Vegas, flying over a big lake. This is where Kitty Hawk - a company owned by Google co-founder Larry Page - has set up a small hangar and training facility. It’s where new flyers learn the ropes, a process that currently takes a mere 90 minutes. Most of it is spent rehearsing what happens if something were to go wrong. The training begins in a basic simulation, a computer game that teaches you about the two controls you need to worry about - one switch to control altitude, and a small joystick to handle direction. Then you move on to a real Flyer that is strapped to the ground, an exercise designed to remove any nerves you might have about being in the vehicle. And then you practice getting out in an emergency. The team has set up a ball pool to rehearse getting out of the craft if it happens to land upside down on the water. And then you’re good to go. Sadly, the company wouldn’t let me try it out the Flyer for myself. For now I’d have to stand on the shore and watch Brittney Miculka perform manoeuvres over the water. “I really don’t have to think about a lot other than letting the aircraft do its thing and then putting it where I want to go,” she told me after completing her flight. The Flyer seats just one person and is, for lack of a clearer description, essentially a massive drone. It was being worked on in secret until its unveiling at the beginning of this year. Ten motors power 10 propellers independently, and that’s all there is to it. The company predicts it will one day sell for the price of an electric car. So, you’re looking at around $40,000-$50,000 (£30,800-£38,500). It is currently limited to flying at 6mph (9.5km/h) , and the battery lasts around 20 minutes. Right now the team tests it over a lake because it’s not legal for it to be flown over any congested areas, or at night time. But that will come eventually, the team predicts. “Working with the regulatory bodies to figure out how to move from recreation to exploration to transportation is going to be super important, and that’ll take time,” said Todd Reichert, Kitty Hawk’s lead engineer, speaking to the BBC. The Flyer weighs 250lbs (113kg), which, very importantly, makes it within the US Federal Aviation Authority’s definition of an “ultralight” craft. That means you are not required to have a pilots licence. However, anyone weighing more than 200lbs (91kg) is not allowed to fly. And that, in many respects, is the real story here - not that it flies, but that it’s accessible and apparently so easy to control. It’s progress that would move flying cars from being a silly toy for the rich into a potentially revolutionary new mode of transport. But one obvious hurdle will be handling different weather conditions. Currently Kitty Hawk doesn’t allow new pilots to fly if the wind is 10mph (16km/h) or stronger - that’s a fairly light breeze. “Any limits are only temporary,” Mr Reichart said, saying the 10mph measure was a precaution. The team told me they haven’t had any crashes - at least, not while a human being has been on board. They have had to land on the water in the past, Mr Reichart told me, but wouldn’t share more details. Safety will be of utmost concern to regulators, and indeed anyone in (or perhaps under) one of these vehicles. Willi Tacke from aviation magazine Flying Pages thinks one route to make mass-market flying cars safer would be to use full autonomy - in other words, letting the computer do all the driving. “I think the computer is much smarter in steering this kind of thing than any pilot can be,” he said. For me, I think the location of this facility couldn’t be more convenient. “Try out a flying car!” feels like an experience tailor-made for Las Vegas, the kind of activity you’d buy someone as a birthday gift. So at the very least, the Flyer is already a hugely exciting attraction. But we’re still a long way from Kitty Hawk achieving its ultimate aim of eliminating traffic from our daily lives.